There was one thing I was right about though–these two books function like one really long book, with what feels like an almost arbitrary break between, so it’s no good reading one without the other, or trying to talk about them separately! Ten years after The Thrawn Trilogy (and 15 years after Return of the Jedi), the Empire has been beaten back to a tiny fraction of its former strength. Supreme Commander Admiral Pellaeon believes they have no choice but to surrender to the New Republic. Unbeknownst to him, Grand Moff Disra has a plan afoot–he’s found a conman who can pose as Grand Admiral Thrawn, the brilliant tactician who nearly reversed the Empire’s fortunes before; and a member of the elite guard with enough tactical genius to support him. Meanwhile, the New Republic is struggling to hold itself together, especially when revelations come out that an unidentified group of Bothans contributed to a world’s destruction (like Alderaan, but not) some 50 years ago. With many worlds demanding vengeance be taken on the entire species, and others using it as an excuse to fight their own battles, the New Republic is swiftly on the brink of civil war. Leia, Han and various friends try to put out fires and find answers at home. Luke does his own investigating, around the galaxy and using the Force, until he’s eventually drawn into a rescue mission of Mara Jade. Looong plot! There’s a LOT happening, and I think that’s both the strength and the weakness of the books. So many cool things are going on–but so many things are going on! Zahn moves the point of view around with every different plot thread, so between the two books we spent time with Leia, Han, Luke and Mara (together and separate), Lando, Talon Karrde, two different mercenary female warriors (it’s complicated), Wedge Antilles of Rogue Squadron, General Bel Iblis, and no less than five separate groups of Imperials. To Zahn’s credit, all of these people had interesting things going on, and I had surprisingly little trouble keeping it all straight. At the same time, I still felt like I was frequently being sidetracked from the couple of plotlines that I liked best, or from the characters I most wanted to see. I think I might have liked these two books better as one book with half the subplots. However…these were still solidly engaging books. I did overreact about the fake Thrawn all those years ago. While I am still a little disappointed that it wasn’t the real Thrawn (such a cool villain! ), the con turned out to be pretty brilliant too. I especially liked the way it sent all the other characters into a tailspin, second-guessing themselves because they think Thrawn is manipulating them. So some of the best aspects of Thrawn-as-villain still came through. 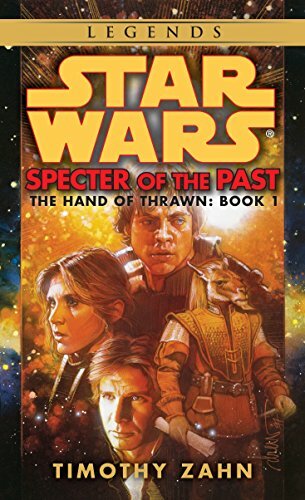 Luke had a particularly good thread here too, especially in the second book when he connects with Mara. Those two play off each other so nicely, and they both underwent powerful character growth in the second book. There’s some intriguing examinations of the Force as well, as they each explore their abilities and limitations. I have a few -well, more than a few- Star Wars novels, but I haven’t read this one. You know, as much as I loved the original movie trilogy (now called Episodes 4, 5, and 6), I’ve only read one of the novels, and it was Lucas’s own novelization of Star Wars (Episode 1 back then, now Episode 4: A New Hope. Grrr, these name changes get annoying.) Actually, I’ve read it in both English and Spanish, the latter just for fun and practice. I’ve meant to try some of the novels someday, but I was always put off by them not being “canon” — which is ridiculous given that I happily read some of the Star Trek novels, and the same can be said of them. So… I guess someday I should pick the Star Wars novels up and read them. …I wonder how much the new trilogy will adhere to any of the novels’ vision of the New Republic and Empire’s future? I have these but have not read them either. We are going to be doing a Star Wars group read this summer and are planning to read Heir to the Empire. It has been decades for me, so I’m looking forward to it. And I was hoping you might be able to tell me what to read next! 🙂 A Star Wars group read sounds amazing–I just read Heir to the Empire, but I’ll look forward to seeing everyone’s posts!